LG's upcoming handset wristset will sport a 1.43-inch (3.63-cm) screen used as a keypad for making calls or fiddling with high speed internet (apparently with tiny fingers). It will also have a camera and speaker built in for video calls and still shots. Other features include MP3 playback, Bluetooth, text-to-speech commands, speaker phone, and some assurance that unlike a phone headset, people on the street won't have to calculate whether you're a dangerous lunatic screaming something about your precious Mr. Shangles' liver medicine into the thin air. 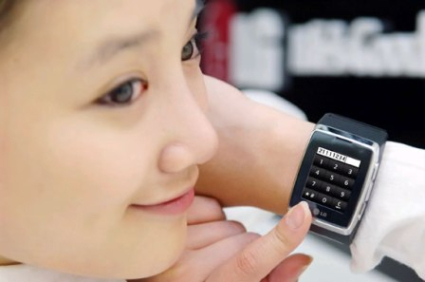 While there's no specific mention of it, we'd like to think the wrist watch phone will also tell time. That would be terrifically convenient.